I Just had a great conversation with my friend. She is researching stem cell at John Hopkins and then I stumbled upon this article. I think women would be great in that field. (CNN) – While it has been argued that science, technology, engineering and math may open the door to more job opportunities, it seems that fewer women are pursuing those courses of study, at least at the nation’s community colleges. A study released Tuesday by the Institute for Women’s Policy Research says that while women represent a majority of college graduates overall, only 27.5% of Associate’s degrees and occupational certificates in the STEM fields were awarded to women in 2007. Cynthia Costello, the study’s author, found that women are losing ground: This statistic was more than 10% higher in 1997. Underrepresentation in STEM fields at community colleges may be part of the reason women lag behind men in the STEM workforce. According to the study, women make up almost half of the American workforce but only around a quarter of the STEM labor pool. Data presented in the study shows that women are leaving some STEM fields. From 2000 to 2009, the number of women working in computers and math dropped about 3%. While the number of women employed in these fields is falling, the Bureau of Labor Statistics projects that the rate of American STEM job growth is outpacing job growth overall. The agency says that while the U.S. economy could add 10% to its workforce between 2008 and 2018, many STEM fields are expected to grow around twice that rate. Women’s salaries in STEM occupations lag behind the median earnings of men, but this gap is generally smaller than the gender wage gap found in other fields. In addition, STEM fields generally provide higher salaries than positions that require a similar level of education. Costello suggests that the combination of higher salaries and increased growth provides women and minorities an opportunity to increase their presence in the STEM fields through obtaining an Associate’s degree or occupational certification. Shorter-term, cheaper community college STEM programs, Costello argues, can help single mothers and their children rise out of poverty easier than typical four-year degree programs. 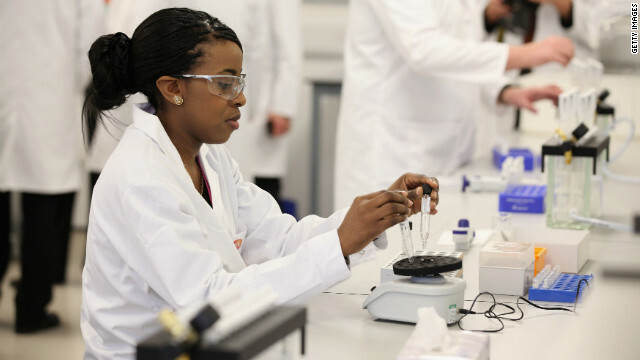 Costello’s report outlines a few rationales for the drop in women choosing STEM fields. A lack of female role models, instructional methods that are not geared toward women, and care-giving roles at home are cited in the study as reasons for women not entering these fields. The Institute for Women’s Policy Research, which developed this study, describes itself as a nonprofit organization that funds research regarding economic and social policy issues that affect women. The study, “Increasing Opportunities For Low-Income Women And Student Parents In Science, Technology, Engineering, And Math At Community Colleges,” can be found on the Institute for Women’s Policy Research website.